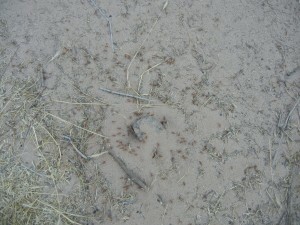 Red Harvester Ants are prevalent at campsites and beaches. Grand Canyon ants hustle and bustle as they salvage crumbs in the sand on the beaches in and around camp. The ants in the Grand Canyon are not Fire Ants, but rather a Red Harvester Ant. They are a little pesky but you can co-exist. First, learn to recognize nest locations and ways to avoid the ants to begin with! 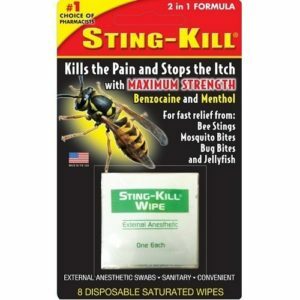 But if you get a sting it is good to know what to do. 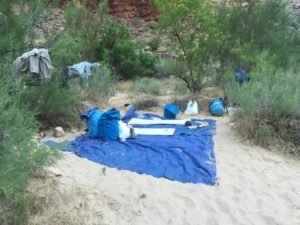 Here are a few tips to live harmoniously with Grand Canyon ants on your next trip with Arizona Raft Adventures. Sometimes finding a nest free zone is a challenge! As always, be aware of your surroundings. Look for nests. Sit away from nests. Set your sleeping area up in a nest free zone. Nests are usually in the shape of a mound with a hole in the middle. You will also find a lot of pebbles on the mound. The ants bring pebbles up out of the soil as they build. In heavily used sandy camps, the nest may only be identified by a small hole(s) in the sand. 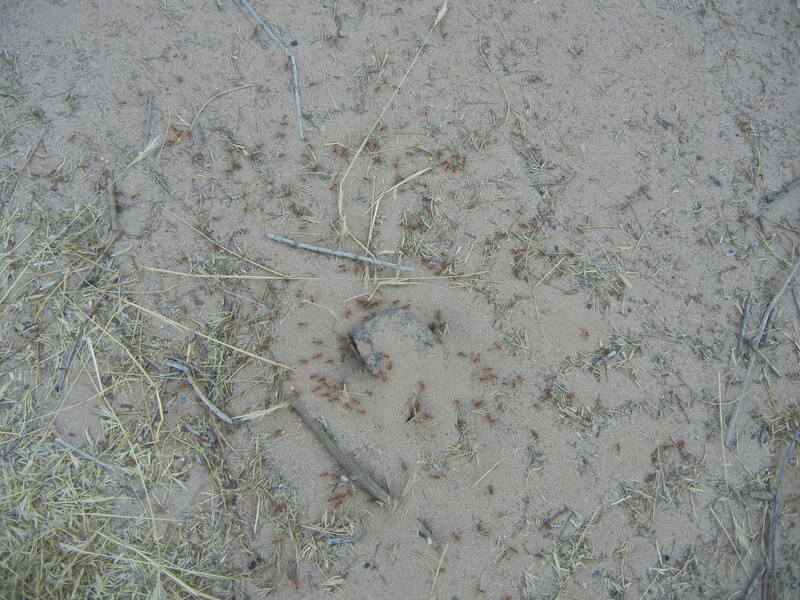 Another sign that you are near a nest is that you see a lot of ant activity. They are very busy. Grand Canyon ants only sting when threatened. This means they will crawl on you and not sting unless they get pinched or squished. The most common site for a sting is on the foot. Ants get stuck under a sandal strap and it presses down on them causing them to sting. It is best to wear shoes and socks in camps where there are a lot of ants. Also, carefully shake out all life jackets, clothes and shoes before putting them on or putting your gear away in your bags. If you discover an ant crawling on you or your stuff, gently flick or shake it off, do not swat it. In addition, Grand Canyon ants are generally only active during daytime hours (diurnal creatures). Therefore, do not lay your sleeping bag out until you are ready to climb in it. This helps prevent stray ants from making a detour on their way home to their nest. Bite swabs are located in the kitchen first aid kit if you need one quickly. Stings happen on nearly every trip. Tell your river guides if you get stung. There are bite swabs in the kitchen first aid kit. Apply the bite swab immediately and you may be able to reduce some of the pain. Another potential pain reliever is cold water. 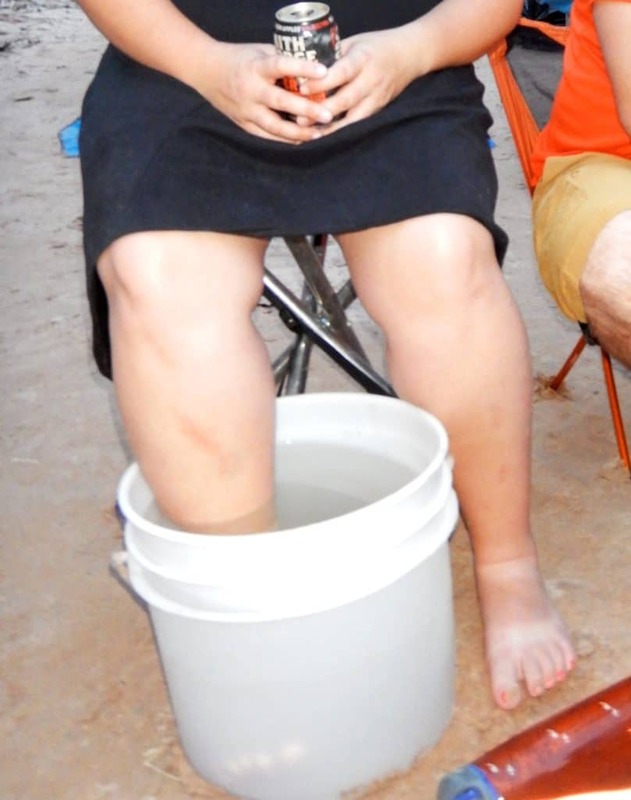 Soak the sting area in the river or a bucket of river water. Your favorite pain reliever may also help. Benadryl is a recommendation from some previous patients if you find it difficult to sleep. Some people have very strong reactions to the sting. This results in painful throbbing in the lymph area of the groin as the toxin travels through the lymphatic system, as well as local pain at the bite. The pain can last up to 24 hours. This is not an allergic reaction, but a strong systemic reaction to the toxin. Allergic reactions, such as anaphylaxis, are extremely rare. However, if hives develop or any swelling of the airway, it could quickly become a serious emergency situation. Some people may consider Grand Canyon ants a nuisance, but they are actually very phenomenal creatures! Did you know they are commonly called Fire Ants? In addition, there are really fascinating facts about their life cycle and their place in nature. Find out the difference between a Fire Ant and a Red Harvester Ant and other facts in Part I of a two series feature: The Red Harvester Ant.